Cairo's Qasr Al-Nil Appeals Court issued a one-year suspended prison sentence against former head of Egypt’s Press Syndicate Yehia Kalash and two board members for harbouring fugitives inside the syndicate's headquarters. This is a lessened prison sentence compared to the original verdict issued in November by a Cairo misdemeanour court of two years in prison for Kalash and board ‎members Gamal Abdel-Reheem and Khaled El-Balshy. This suspended sentence means Kalash, Abdel-Reheem and El-Balshy will not serve jail time. However, if the any one in the trio commits a similar offence within the next three years, as mandated by the appeals court, they would have to serve the one-year prison sentence. The verdict can still be appealed in front of the Court of Cassation. Dozens of journalists, who gathered inside the press syndicate after the ruling, organised a protest in front of the Syndicate Saturday noon, protesting the verdict against Kalash, El-Balshy, and Abdel-Rehim. 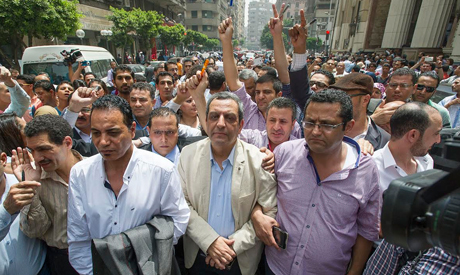 A number of members of the newly-elected Syndicate board attended the protest, such as Amr Badr, Mohamed Saad Abdel Hafiz, and Mahmoud Kamel. Kamel announced that the board will hold a meeting on Sunday noon to discuss legal and other procedures to be taken, following the ruling, Al-Ahram Arabic website reported. The trio were accused in April 2016 of harbouring journalists Mahmoud El-Sakka and Amr Badr. Journalists El-Sakka and Badr were among many wanted on arrest warrants ahead of 25 April 2016 protests against the Egyptian-Saudi Red Sea island maritime border agreement. Badr and El-Sakka were arrested inside the Press Syndicate premises. They were later released on bail pending trial. Kalash lost the elections for the head of journalists syndicate this month receiving 1,890 votes compared to 2,457 votes for new syndicate head,, journalist Abdel-Mohsen Salama. Similarly, El-Balshy lost his seat on the syndicate’s high board, but Abdel-Reheem was re-elected to his seat.